Layers of Color New Release Featuring Nina B Designs stamps! Welcome to a very special Layers of Color New Release Blog Hop! If you have arrived from Diana Queen's Blog, you are in the right place, otherwise you may want to go back to the beginning of the blog hop, so you don't miss out on the amazing inspiration along the way - and the hidden prizes! This gorgeous line has delicate Fairy Wishes that pair perfectly with the large blossoms from Dotted Dahlias and Dotted Peonies. And there are Sweet Silhouettes that are lovely with Beautiful Laceand Elegant Labels. 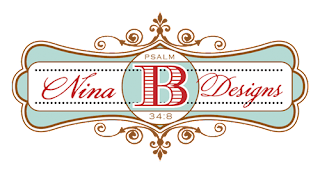 To inspire you with delightfully fresh ideas, Layers of Color designers have created their best projects withNinaBDesigns new release stamp sets. Come visit the newest clear stamp art galleries! 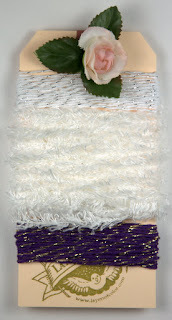 Angel's Twine and Feather Twine! These unique and pretty card embellishments are found exclusively through Layers of Color boutique. Angel's Twine is a thinner cotton than Baker's twine with a metallic thread twisted through it adding a special sparkle. Feather Twine is soft, feathery and sweet as butterfly kisses. Both lovely twines are coupled together on a reusable artist's tag with a free fabric rose! Well, I could show you card after card with these beautiful images but I'll let you check out our other DT members cards instead! ;) I know you will be inspired by them all! Now for the FUN part: Giveaways! You can see more of my projects in my Layers of Color Gallery, while you are there make sure you check out the other Design Team galleries there is so much inspiration waiting to be discovered, we are thrilled that Layers of Color is a Spellbinders Preferred Product Partner. You can also check out Layers of Color Art Stamps on ourFACEBOOK GROUP and have a look at the Layers of Color Art Stamps FLICKR GROUP where you can upload your LOC artwork and be inspired by hundreds of fabulous LOC creations! You are going to LOVE it!! Gorgeous!!! I love the samples you have done with Sweet Silhouettes! I still haven't inked that one up....today...I hope to do so today! So pretty! I love silhouettes. Love the elegant cards you made with the silhouettes. You are so right... can't go wrong with these beautiful images! Gorgeous creations! Beautiful cards and love how you used the Silhouette images. Gorgeous and perfect scored background. Definitely, very elegant cards! Love the beautiful scrolled script of the sentiments. Such elegant cards. Love the black and white combination. Love both of your cards, the silhouette images lend themselves to layering so very nicely! Thanks for sharing! Beautiful cards, loving the silhouettes! the embossed background is perfect! I love these new stamps! Those silhouettes are just to die for! Gorgeous artwork! You showcased these new images beautifully! Janice, I love how your cards turned out. My favorite one is the wedding one. Have a blessed day! Neat silhouette images! You used them beautifully, in such a classic way. Love what you've done with the silhouettes! Great cards showcasing some fun silhouette stamps!! How absolutely sweet!. The silhouette's are beautiful!! Love the gorgeous cards. Very elegant!! Gorgeous cards in the b&w!! Hi Janice! I hope you are doing well in your new home. Your cards are so awesome. That wedding card is just gorgeous and I love how you chose to score the lines. And the chevron pattern is awesome. I never would have thought I would like a chevron pattern, but girlfriend you sold it! Wow on those silhouettes, what stunning cards. What beautiful cards you have crafted! Love the new release and the silhouettes! They are so classy and your cards showcase them beautifully! Blessings! Oh my can't pick a favorite--love them both! Janice these are stunning and oh so elegant!! Beautiful cards! This is such a lovely release! Ohhh Jancie, I love your silhouette cards!!!! I think you could cover the entire wedding party with these marvelously gorgeous stamps! Nina has done it again! Thanks LOC! Tried to comment this morning (Aussie time) but you guys weren't all up yet.....so now is the first chance to get back to you.....10.30pm Aussie time!! LOL!! Love the cards, both of them very elegant....great job. So, so pretty, Janice. I esp love the first card. Thank you! Layers of Color Tea Party Blog Hop!!! Save the Date for LOC's upcoming New Release!